People for the Ethical Treatment of Animals want Michael Vick's name crossed of the list of potential cover athletes for the upcoming Madden NFL 2012. Philadelphia Eagles quarterback Michael Vick is known for two things. One, he's a pretty good football player. Two, he ran an illegal dog-fighting ring and personally took part in the horrific torture and execution of dogs who failed to adequately perform. Because of the first point, he's one of 16 players who could be voted by fans onto the front of the Madden NFL 2012 box, but because of the second, PETA wants him taken out of the running. It doesn't appear likely to happen, though. "I can tell you we've already received the letters from our good friends at PETA urging us to take him out of the bracket," EA Sports president Peter Moore said at the World Congress of Sports in Miami. "I personally believe, and this is personal commentary right now, that Michael served his time. He's had a tremendous season." That may be true, but I'm a little surprised that EA isn't put off by the optics of the situation. Great football player or not, Michael Vick is a first-class piece of garbage who spent years getting his kicks torturing and killing dogs. With all the talent in the NFL to choose from, why EA would invite a potential backlash by even giving a sideways glance to such a notorious scumbag is completely beyond me. But if PETA really wants Vick to suffer, it shouldn't just withdraw its objection, it should have its members voting for his selection. The infamous "Madden Curse" has taken a terrible toll on just about everyone who's appeared on the cover of the game, including none other than Vick himself. 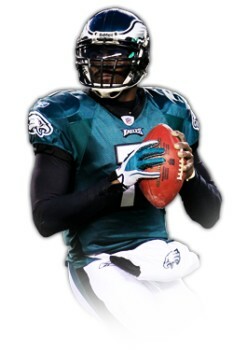 After appearing on the cover of Madden NFL 2004, Vick broke his leg in the following pre-season and was out for 12 games.